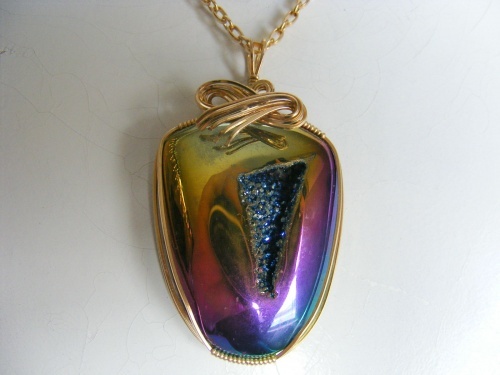 This absolutely stunning piece of Druzy has outstand colors shining in all directions. The gold sheen would even make Midas jealous! Piece is wrapped in 14k gold filled with swirls that enhance the beauty of the stone. Piece is not for the faint of heart as it measures about a little over 2" long and 1 1/2 wide. Just big enough to add to the dramatization and make you feel soooo pretty when wearing it. Comes with a gold filled chain.